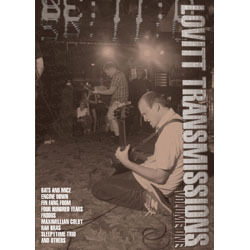 Bands featured on Lovitt Transmissions draw heavily from Lovitt's early history and include: Bats & Mice, Engine Down, Fin Fang Foom, Four Hundred Years, Frodus, Maximillian Colby, Milemarker, Rah Bras, and Sleepytime Trio. The DVD is over two hours long and features optional audio commentary by Lowit, Jason Hamacher from Frodus, and Charles Cardello from Bifocal Media. Extras on the DVD include a visual of Lovittï¿½s family tree, supplemental tour footage, and a rap video from Cornbread Compton of Engine Down. Lovitt Transmissions: Volume One is a comprehensive, collaborative showcase of the labelï¿½s talent that will appeal to rabid fans and casual listeners alike.